A new study from eMarketer finds TV and web video may converge in 2011, reports BusinessWeek. Major media companies like Sony are already starting to blur lines. Recently launched Crackle touts high-quality video and has the goal of finding high-quality talent to fill the netwaves. Yahoo is testing animated window-shade ads that users can pull down over a video and graphical ads that appear during a video in the same way TV networks show ads at the bottom during programming. Startup VideoEgg is experimenting with overlaid graphic ads that appear within content. A good move, considering 77 percent find current video advertising, such as pre-roll, too intrusive. Cost is also a major reason why video is growing. Startup Ebuco Digital Production produces cost effective internet videos. YouTube is great if you know what you’re looking for. But what if you don’t? To rescue those paralyzed by choices, Mesmo.tv plans to handle the programming for users, according to NewTeeVee. 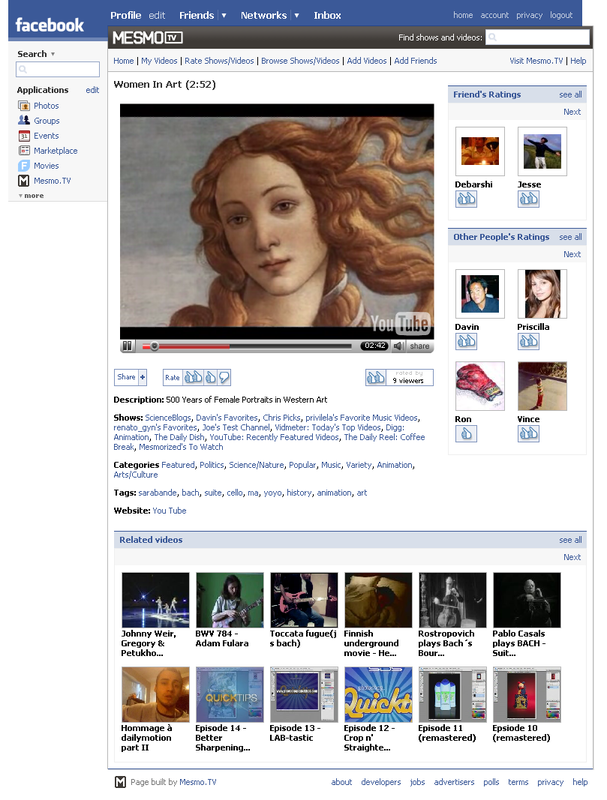 Mesmo.tv is like Last.fm or iLike for video – where users find content to watch with the help of other users. Expanding on this idea, Mesmo has built a Facebook app and plans to park features into other environments, such as iTunes and Joost. Kelton Research published a survey which found that a majority of the 126 million Americans who view online videos each month were dissatisfied with the experience. A staggering 96 percent said they couldn’t find what they were looking for and 45 percent said they only watched content found by a friend or colleague. Vuguru, the Michael Eisner-led media production entity behind the Prom Queen series, has announced plans for its next online serial, reports MediaWeek. The show will be called The All-For-Nots, a fictionalized look at an independent band and its experiences on tour. Each of the 24 planned episodes will take place in a different city. Episodes will run seven minutes in length. New ones will be released weekly, more closely mirroring a TV show’s run. Dinosaur Diorama Productions will create the show, as well as shorts and concert footage to accompany the main episodes. Vuguru also announced a second run of Prom Queen, this one sub-titled Summer Heat. New episodes will roll out in August. 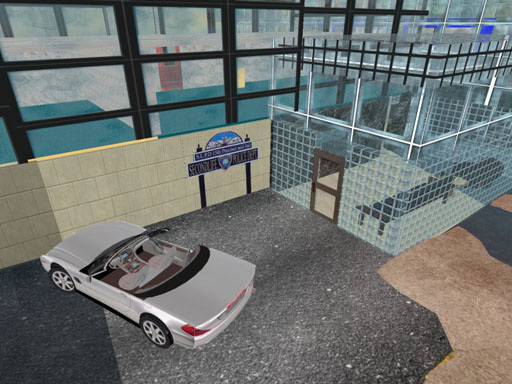 Last month, the Vancouver Police Department (VPD) held a recruitment seminar in Second Life. Yes, you read that right: recruiting law enforcement officers through a virtual world. The idea, the VPD said, was to target a generation who are extremely web-savvy. If they are early adopters venturing into a virtual world, then they must know a thing or two about new technology and how to operate efficiently online. Like so many new initiative in Second Life, this one feels like a rather expensive PR exercise, designed to cash on the virtual world’s hype. However, further into The Vancouver Sun’s report, are a number of telling quotes from Inspector Kevin McQuiggin, head of the police department’s tech crimes division, which suggest that the exercise may actually have more merit — in the longer term, at least. MTV has launched a new site that allows people to create their own video mashups, reports Billboard. The Video Remixer site lets people take clips from current and classic videos, along with photos and other media, and mix them into a new creation. The channel then takes the best ones and gives them airtime. MTV is slowly making new videos from hot artists available for the mashup offering, in addition to a trove of archived video footage. Officially sanctioned video mashups are building popularity as a way to increase user engagement online. It also creates a limitless supply of new video that can have ads inserted, providing an influx of newly created revenue potential. 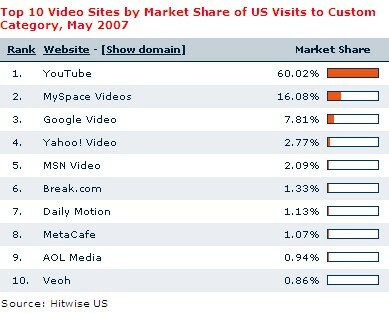 As of May 2007, YouTube’s market share of visits to video sites was 50 percent more than that of those 64 sites combined, according to Hitwise. The top 10 list in Hitwise’s video site custom category for May is headed by YouTube, with 60 percent of visits, followed by MySpaces Videos with 16 percent and Google Video with less than 8 percent. Search engines are responsible for about 20 percent of traffic to all video sites. Hitwise captured 23,696 search terms that sent traffic to its custom category of 65 video sites in the four weeks ended June 24. In the corresponding year-earlier period, Hitwise captured 110,775 search terms sending traffic to the same category. There has been a 300 percent increase in the amount of traffic leaving search engines and going to video sites in the past year.